Four generations after World War III, after the nuclear winter, after the plague and after the collapse of humanity a "new" breed of creatures lay claim to much of the world: intelligent mutant animals! After the Bomb® provides rules and background material for going beyond the original TMNT or Heroes Unlimited™ games on to a world ruled by mutant animals! Player characters can be any possible type of mutated animal: Bear, Cat, Dog, Rat, Bird, Alligator, even Turtles. They may be members of one of the various "nations", like the Rodent Cartel, Gatorland, New Kennel, or the Wolf Barbarians, to name a few, or they can be freewheeling adventurers or mercenaries. Your overall goal is likely to be to safeguard your fellow mutant animals from the evil schemes of the Empire of Humanity; the strongest, most technologically advanced force in the known world. Adventures range from scavenging ruins of human cities to combating roving bands of marauders and bandits, to fighting the robots and treachery of the Empire of Humanity. Watch out for the Gun Bunny survivalists and the Psycho-Zombies! Encounter tables, including mutated insects. Compatible with Heroes Unlimited and the Palladium Megaverse. This is an expansion for the (out of print) Teenage Mutant Ninja Turtles & Other Strangeness RPG. It contains background info for the After the Bomb setting, but no basic rules or character creation rules. 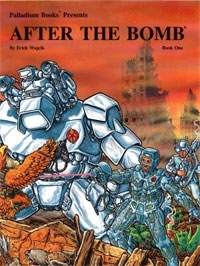 If you don't have the print edition of TMNT&OS you would be better off buying the After The Bomb RPG PDF. As far as I can tell, everything in this book, is included in that one, except for a couple of illustrations. This title was added to our catalog on April 25, 2009.